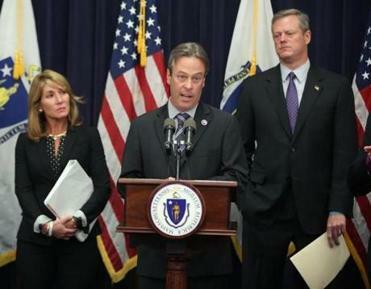 Governor Charlie Baker during a State House press conference, where he and child-protection officials announced system-wide reforms to the Department of Children and Families. Now, Governor Charlie Baker has made it clear that he believes the balance has tilted too far in one direction. While some applaud that intent, others said it could lead to more children being separated from their parents and placed in foster care, even without proof the children are being abused. 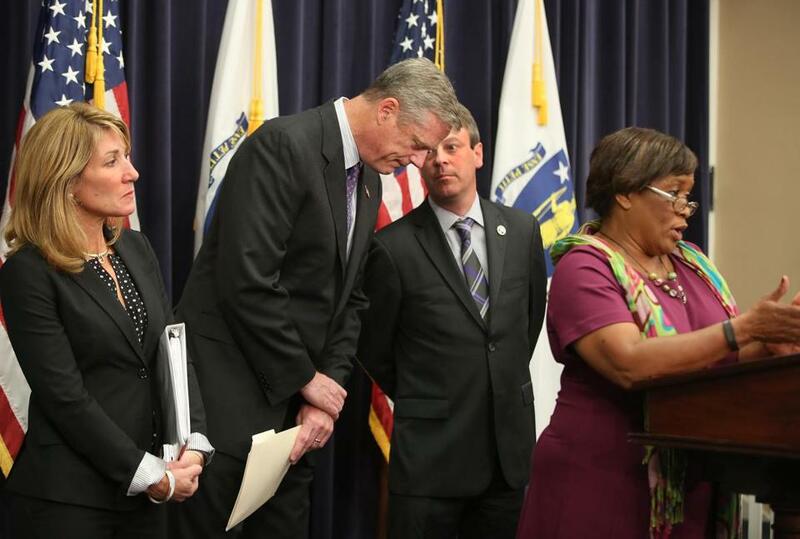 “The work that will be done from this point forward will focus on one major objective — to keep kids safe,” Charlie Baker said. That has been the pattern after major crises have hit the child welfare departments in New York, Los Angeles, Chicago, and other cities, said Martin Guggenheim, a specialist in child welfare at New York University School of Law. There was also a sudden spike in children being removed from their homes in Massachusetts last year, when DCF workers came under intense pressure to eliminate any risk of abuse following the disappearance of Jeremiah Oliver, a Fitchburg boy who was being monitored by the agency and whose body was later discovered on the side of a highway. Baker’s declaration to focus squarely on safety followed a recent spate of children’s deaths and sparked a debate among child welfare advocates. They point out that nearly 90 percent of the children with open DCF cases are being monitored at home or have a plan to return home, meaning family preservation is an inherently vital piece of the agency’s mission. And the recent case of Avalena Conway-Coxon, a 2-year-old who died of heat stroke in an Auburn foster home that was improperly licensed by DCF shows the foster care system itself is no guarantee of safety, some said. In addition, a 2007 Massachusetts Institute of Technology study found that children ages 5 to 16 who were removed from their homes and sent to foster care had higher delinquency rates and teen birth rates and lower earnings than children from similarly troubled families who remained at home. Mike Dsida, deputy chief counsel at the state public defender agency, said he was concerned Baker’s comments did not recognize that children can be kept safely in their homes if the parents are given appropriate support. But Peter MacKinnon, president of the union that represents DCF social workers, praised Baker for initiating what he called an important philosophical shift. MacKinnon said DCF has leaned too heavily on a “family preservation model” since 2009, when the agency launched a system designed to separate high-risk and low-risk cases. The high-risk cases, which involve allegations of serious physical or sexual abuse, are referred to social workers who investigate the safety of the child, while the lower-risk cases, which involve neglect, are given to social workers charged with strengthening families. “The pendulum swung too far, not out of ill intent, and we needed to get back to the middle,” MacKinnon said. And unlike past governors who promised to focus on safety but did not act on their rhetoric, he said, Baker is moving swiftly to rewrite policies. The new rules, for instance, will require more thorough supervision of complex cases and criminal background checks in all cases of parents accused of abuse or neglect. Currently, the agency conducts those checks about 70 percent of the time. Still, it remains to be seen if the governor will fundamentally shift the agency’s mission, said Elizabeth Bartholet, a Harvard Law School professor who argued that such a change would require an overhaul of the policy that separates high-risk and low-risk cases. Baker insisted last month his comments were not an attempt to de-emphasize family preservation but to clear up “mission confusion” at DCF. Commissioner Linda Spears said the department had in the past considered protecting children and keeping families together as two contradictory goals.